The Department of Justice (DOJ) on their newly launched NBI Clearance online application system this January 2014 receives disappointment and criticisms as the new process did not eliminate the long lines and chaos of applicants and lots of questions bombard online for the step by step guide and requirements for the renewal and new application. However, DOJ Secretary Leila de Lima said that in the new NBI clearance system, they will continue to roll-out and implement solutions to progressively eliminate queues and simplify processes. In addition, Director of NBI Virgilio L. Mendez said that we can expect significant progress in the coming weeks. Meanwhile, the NBI also released step by step guide in applying NBI clearance thru online application - a quick reference of new applicants and renewals. 1. 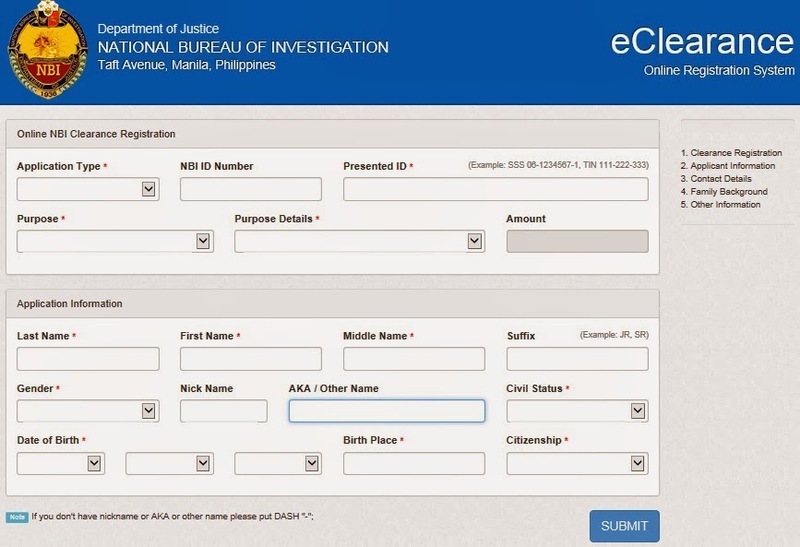 Access the NBI Clearance Online Application page through www.doj.gov.ph/nbi or www.nbi.gov.ph. 2. Fill-up the application form online. Provide information correctly and completely. Choose from the drop-down menu provided for some details. The amount will be automatically reflected with range of P115 to P415 depends on transaction purpose. Note that the valid ID will be used also in Step 4 below as you're required to proceed to NBI Clearance Office. Once finished on clearance registration and Applicant Information fields, click the SUBMIT button to open the remaining steps. The next fields for fill-up are Contact Details and Family Background. Make sure to review your inputs specially on e-mail address as the system will send a confirmation to it. Once done, click the SUBMIT button once again. 3. After the successful online application, print the said form bearing your assigned Registration Code. For those who have no printer, write down the Registration Code or save the file as PDF for later use. 4. Proceed to NBI Clearance Center near to your location, present your Registration Code and 2 valid IDs (original with your signature) and pay the corresponding clearance fee. Observe or inquire to guard or any authorized personnel where to fall in line for this transaction. 5. Proceed to Online Application Counter for the capturing of your image and fingerprint biometrics. 6. For 'No Hit' applicant, proceed to Releasing Section, for the printing and issuance of your NBI clearance certificate. "With Hit' applicant, you'll be advised to come back on the release date written at the back of your Official Receipt (OR). When advised to proceed to Quality Control Section for interview, your clearance will be issued upon evaluation and cleared by the QC Interviewer. Note: Hit is a process made by NBI Clearance personnel to verify the identity of the NBI Clearance applicant if he/she has a derogatory record. Note: Most of the NBI satellite offices are closed on weekends (Saturday and Sunday). The DOJ boasts that around 36,000 applicants used the new online clearance system on the first day. However, these applicants still need to undergo on the traditional system - long line for the payment and biometrics. According to some reports, some of the satellite offices are not yet fully ready as the online clearance application was launched last month. The experience of applicants on the new process will vary per NBI satellite office. NBI admitted that the automated system will continue to improve in the next few weeks. It is also recommended that NBI should separate the line of those who filed thru online to those that are walk-in applicants. Payment system should be improved also same on NSO and passport application. Let's find out some major improvement on the NBI Clearance Online process in the following weeks. For more information about NBI Clearance, call their HelpDesk on Direct Line - 526.12.94 or trunkline - 523.82.31 local 5499. Share now this article if you find this informative for reference of other applicants.